When did cooking become so exhausting? Thanks to information overload and the pressure to impress, we stress over every recipe and every meal. Back to the Cutting Board helps you set aside all that tension and pretense and rediscover a pure, joyful passion for the art of cooking. Professional chef and Emmy Award-winning host of PBS's Christina Cooks, Christina Pirello, takes you on a journey to re-engage with the soul of food preparation, from the slice of the knife to the aroma of steam rising from a perfectly roasted winter squash. With simple, delicious recipes and sage advice on streamlining your kitchen and your cooking, Christina empowers you to create personal wellness by nourishing your body, mind, and spirit. 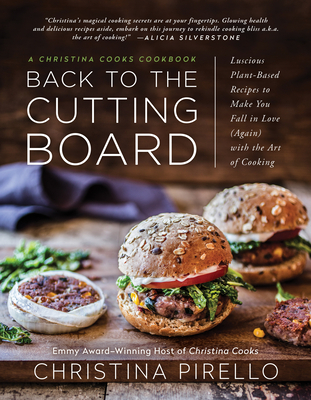 Through more than 100 enriching plant-based recipes that pair the freshest ingredients with cooking techniques meant to optimize their natural, native flavors, Christina reintroduces you to the creative potential of food and transforms the kitchen from into a nurturing sanctuary. In this modern world, with far too much ego at play when it comes to something as simple and beneficial as cooking great food, Christina Pirello invites you to take a step back and truly enjoy every step of the process. An Emmy Award-winning television personality, Christina Pirello, MFN, is one of America's preeminent authorities on a healthier lifestyle utilizing natural and whole foods. This bright, free-spirited, vivacious redhead with a radiant personality delivers a much needed message to the world. She's made it her purpose in life to show the world that everyone can look their best and feel great too, by learning to correctly select the best ingredients available. Christina's love affair with food began at a young age when she spent many happy hours cooking with her mother, who centered the family life in her Italian kitchen. That joy prepared Christina to understand the healing power of food. An understanding Christina would put to its test at age 26 when she was diagnosed with terminal leukemia. A chance meeting with her now-husband Robert Pirello would change her life forever. Robert, a whole foods advocate, helped Christina change her lifestyle and diet based on healthy eating incorporating whole and unprocessed foods. Christina overcame the odds and in the process developed an expertise in cooking with whole natural foods. From that time, she was utterly convinced of the close relationship between diet and health. She found her life's calling was to help others discover the importance of this relationship in their own lives. Christina studied and became an expert in Traditional Chinese Medicine, Ayurveda, acupuncture, macrobiotics and earned a Masters Degree in Nutrition and has authored seven cookbooks on the subject of healthy eating and natural living. Today, almost 34 years after her illness, Christina is a glowing example and inspiration illustrating that food choices have an enormous impact on health and well-being. Utilizing her internationally-respected TV show Christina Cooks and her many books, she is "changing the health of the world one meal at a time."